Lip smacking colours that pack a punch of more colours, tantalizing flavors specially created to suit Indian preferences. More colours from the collection, deep shades specifically designed for Sun-kissed Indian skin tones. For a smack of translucent colour. It gives intense 12 HR care, adult strength formula with coconut oil, Vitamin E and SPF 20 moisturize lips for 12 hours. These baby lips lip balms comes in a cardboard packaging and the lip balm tube is tiny pretty and easy to carry with you anywhere. These lip balms in a small twist up tubes and the tube colours varies according to the shade. It is travel friendly. The shades I am reviewing here are Spicy Cinnamon and Berry Sherbet. There is no doubt, Berry Sherbet is my favorite lip balm and this one replaced my old baby lips lip balm in my pouch. Berry Sherbet is a beautiful brown shade with pink hue. The shade in the lip balm looks dark brown but when you swipe it on your lips it delivers a beautiful pinkish brown colour and makes the lips pretty. I am sure most of our Indian beauties will love this shade and it is a daily wear MLBB lip balm shade for medium to fair skin tones. The Spicy Cinnamon is bit dark brown shade and with slight Red hue, but the Red didn’t visible when I swipe it on my lips. Well, it is a decent Neutral lip balm shade to those who don’t like any colour hues on their lips while wearing a lip balm. I am sure this Spicy Cinnamon shade will become their favorite and best suitable for all skin tones especially for dusky beauties. The Texture is creamier and smoother to swipe on your lips easily. The pigmentation of the lip balm is good, one to two swipes gives you the tint immediately (pigmented lips may need more). As said earlier I am in love with Berry Sherbet shade and this lip balm delivers a beautiful colour on my brown lips. As per the brand’s description this Spiced Up shade collection are especially for Indian dusky beauties. I like spicy cinnamon too. The lip balm moisturizes the lips well and makes it fuller and shinier immediately, but the moisture will not stay up to 12 hours as per brand’s claim. It keeps the lips hydrated maximum for 4 hours with slight snacks and water. It smells very good like a sour fruit. The shade starts to fade away within 3 hours after wearing, but I don’t find any difficulties to reapply this lip balm again. I feel safe when I wear this when I am going out, because it has SPF 20 sun protection is an extra benefit. I don’t have dry flaky lips normally, so I couldn’t comment on its healing power of dry lips. 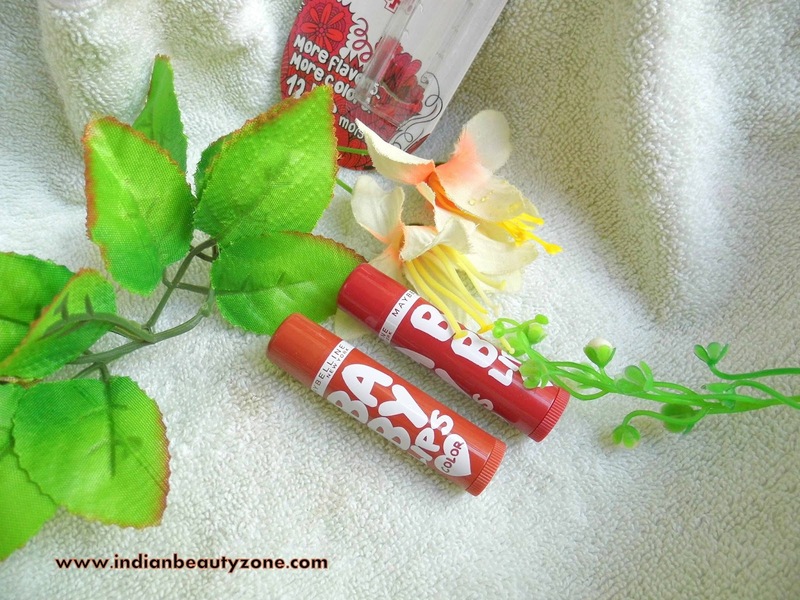 Overall the lip balm collection has awesome shades to make Indian beauties happy with their spicy collection of shades (include me I am also the one), I am happy with the shade which I love. I feel the price should be more affordable than now, so that all girls can buy and use.